The fish fauna of the east coast of South Africa is a mixture of tropical Indo-West Pacific (mainly coral-reef species) and many endemic warm-temperate species. This fauna is not well known, and in the past 20 years our fish survey work has produced numerous range extensions, many new records and several new species. In addition to our own collecting efforts and those of fisheries biologists on South African research vessels, observers on fishing vessels, and fishing companies, our knowledge of the South African fish diversity is significantly enhanced by the specimens and photographs provided by various amateur ichthyologists (divers, anglers, aquarists and underwater photographers). 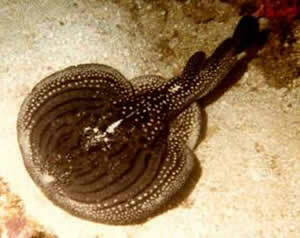 The endemic ornate sleeper ray Electrolux addisoni. Photograph by Peter Chrystal taken at Aliwal Shoal. A new sleeper ray (Family Narkidae) was first made known to scientists by diver-photographer Peter Chrystal (through Rudy van der Elst), who photographed this spectacular ray on a patch of sand on Aliwal Shoal in 1984. The ray was subsequently rediscovered on Protea Banks off Shelly Beach, KZN in 1997 by underwater photographers Stephania and Peter Lamberti who sent us a video-clip of the ray. It has also been photographed underwater at the T-Barge north of Durban by Dennis King and at Aliwal Shoal by Len and Avril Fish, and Allen Walker. A live specimen of the ornate sleeper ray was seen underwater by Phil and Elaine Heemstra at Coffee Bay, Eastern Cape, but it fled before Phil could net it. The ray frustrated scientists by eluding capture for nearly two decades despite efforts by colleagues to collect it. In September 2003 Mark Addison collected a specimen on a reef off Manaba Beach near Margate in southern KZN. A second specimen was collected by Brent Addison at the same locality the following month. Both specimens were presented by Mark to Phil Heemstra of SAIAB and the second specimen was transferred to the fish collection of Iziko – South African Museum. 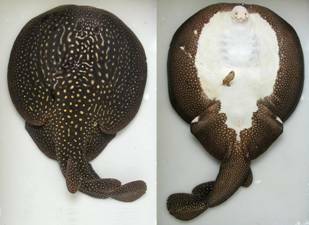 On close examination this sleeper ray was so different to other sleeper rays that Leonard Compagno (of Iziko - South African Museum) and Phil Heemstra had to create the new genus Electrolux for it. Electrolux is distinguished from other genera in the family Narkidae by the absence or rudimentary condition of the forward projection of the snout and the configurations of the spiracle papillae, nostrils, nasal curtain, jaws, chondrocranium, and pectoral and pelvic girdles. The name Electrolux alludes to the well-developed electrogenic properties of this ray (collectors and photographers have experienced the shocking personality of this bold, very active and brightly patterned electric ray first-hand), the discovery of which sheds light (Latin, lux) on the rich and poorly-known fish diversity of the Western Indian Ocean. And the vigorous sucking action displayed on the videotape of the feeding ray that was taken by Stephania and Peter Lamberti may rival a well-known electrical device used to clean the detritus from carpets, furniture and other dust-gathering surfaces in modern homes. The species name is for Mark Addison of Blue Wilderness dive charters (Widenham, KZN) who collected the holotype and instigated the capture of the paratype. Mark Addison has an intimate knowledge of the marine fish fauna of South Africa. It was Mark’s idea that Phil should start Fish-Watch to complement his fish survey work and he was a founder member of Fish-Watch. The dorsal surface of the ornate sleeper ray’s disc, pelvic fins, tail and median fins are dark brown covered with small light spots which are white on the preserved fish but pale yellow in life; spots are larger towards the middle of the disc where there are several scattered, short, pale streaks. In life the ray is covered with mucus and there are several curved, (some concentric) black stripes on the disc which disappear when the mucus is rinsed off. The light spots and streaks are often obscured by sediment when the ray is at rest. The conspicuous dorsal colour pattern of Electrolux addisoni combined with the ray’s boldness near divers and its possible threat display may be indicative that the ray is well-armed (with electric organs) and should be avoided. On the shallow, well-lit reefs where this ornate sleeper ray has been found its main potential predators would be larger sharks. Two species of deep-water electric rays are known to successfully defend themselves from sixgill sharks (Hexanchus). Bite patterns on the electric rays indicated that the sharks grabbed the rays but were repelled (probably with a shock) before they could inflict a strong and lethal bite. These incidents probably occurred in deep water where the sixgill sharks may have been using non-visual senses to locate their potential prey. Neither of the deep-water electric rays have prominent colour patterns and threat displays might be of little use to them in a visually limited environment. However, a quick defensive shock apparently can minimize damage by aborting an on-going predation bout. For the inshore Electrolux addisoni, conspicuous colouration and a threat display might prevent a shark from biting it if the warnings are reinforced by a shock. This ornate sleeper ray has been observed feeding vigorously on loose sand, ‘walking’ on its pelvic fins, and arching its back and tail to apparently perform a threat-display directed at the photographer. As presently known, the ornate sleeper ray Electrolux addisoni, is endemic to the east coast of South Africa in warm-temperate or subtropical waters along approximately 310 kilometres of coastline on shallow reefs (6–35 m) from just north of Durban to Coffee Bay. It could be more wide-ranging elsewhere in the warm waters of southern Africa and even off East Africa. A 1967 survey of electric rays from the east coast of southern Africa did not report this species. To our knowledge no divers have seen this ray on the east coast of South Africa southwest of Coffee Bay and west to False Bay. Electrolux addisoni was not taken by the South African Marine and Coastal Management’s (MCM) research vessel sampling off Mozambique in 1994. The conservation status of this ray is uncertain but worrisome, because it is only known from a few records to date on a heavily utilized narrow strip of habitat with intensive recreational diving, sport and commercial fishing, along with runaway coastal development. Its known habitat and geographic distribution suggest that Electrolux addisoni could be at risk from human activities including harassment and disturbance by divers as well as fisheries, pollution and habitat degradation. There are no known fisheries that target this species or include it as bycatch, although it might become an object of the aquarium trade and would make a spectacular aquarium exhibit provided one could collect live specimens and keep them successfully in captivity. Dorsal and ventral views of the 515 mm TL, Electrolux addisoni holotype collected by Mark Addison off Manaba Beach near Margate. Photograph by Phil Heemstra. The ornate sleeper ray Electrolux addisoni would be an appropriate subject for a dive survey project by fish-watchers and professional ichthyologists on the numerous dive sites of the northeast coast of the Eastern Cape, KZN and Mozambique, to attempt to better understand its distribution and estimate its abundance for the purposes of assessing its conservation status. We welcome reports and photographs of this species particularly from different localities to those we have given.